This week, I call it quits as a bus driver. I didn’t even last a full school year. It’s not because I didn’t like it, it’s simply because my new employment arrangement will just work better. I’ll scale back from being quadri-vocational to tri-vocational and I’ll get more hours in at Lasaters Coffee. It will be nice. I’ve really enjoyed bus driving and it was bittersweet to say goodbye, but it’s for the best. I’ve enjoyed seeing God use me to impact lives there and it was great seeing some of my fellow bus drivers come to church. I enjoyed being called “the Preacher” every once in a while and getting to share why I moved to Clarksville. Most of all, however, I loved the many opportunities I had to share the Gospel with people. Another thing that was a perk of bus driving was quite a few productive study days while on the job. I spent a couple productive days studying while on stand-by in the drivers’ lounge. Most recently, I had a very productive hour and a half study sesh on a bus, on stand-by. I used the steering wheel as a desk and it worked out quite well, surprisingly. 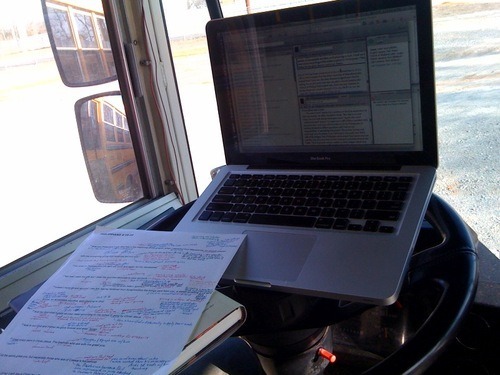 So, that comes out to 6 PROS and 4 CONS, which means that over all, the bus worked out to be a great place to study. Instead of driving home that day with a headache, I came home challenged and encouraged after spending a solid 90 minutes getting rocked by the chapter 4 of Philippians! For all you bi- and tri-vocational people in ministry out there, I’d encourage you to take full advantage of every study situation you get. Always arrive prepared to study or read – you don’t want to get caught in a situation where you could have been studying, but you weren’t prepared. God honors that time that we put in to studying, so be diligent with it and PREACH THE WORD!